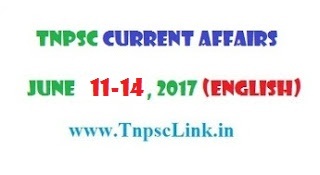 TNPSC Current Affairs June 11th to 14th 2017 in English PDF Format, for forthcoming TNPSC, TRB, TET, TN Police Examinations, Covers International Affairs, National Affairs, State Affairs, Tamil Nadu Affairs, Environmental Affairs, Sports Affairs and Important days. Download this file to PDF format. The International Albinism Awareness Day (IAAD) is observed every year on June 13 to raise worldwide awareness on albinism and to prevent attacks and discrimination against persons with albinism. Albinism is a genetic disorder resulting in little or no pigmentation in the skin, hair, and eyes. The lack of melanin in the skin makes albinos more prone to sunburn and skin cancers. The World Day Against Child Labour is observed every year on June 12 to focus attention on the global extent of child labour and the action and efforts needed to eliminate it. The 2017 theme is “In conflicts and disasters, protect children from child labour” that focuses on the impact of conflicts and disasters on child labour. India has signed a pact with Mauritius to institutionalize cooperation between Parliaments of the two countries. The Memorandum of Understanding (MoU) was signed by Lok Sabha Speaker Sumitra Mahajan and Speaker of National Assembly of Mauritius Santi Bai Hanoomanjee after their meeting in Port Louis. The relationship between the two countries provides a platform for the sustained growth of friendship and partnership. 12 year old Padmalaya Nanda from Odisha has created history by becoming the youngest girl to bag the “Little Miss Universe Internet 2017” and “Little Miss Actress” crowns at the Little Miss Universe 2017 at port city of Batumi in Georgia.She will now participate in the "Little Miss World 2017" competition that will be held at Greece from Sept 25 to Oct 1, 2017.The silver crown was won by Thailand. Ruchira Kamboj (IFS: 1987) has been appointed as the next High Commissioner of India to the Republic of South Africa. She is expected to take up her assignment shortly. She is presently working as Ambassador to Permanent Delegation of India to UNESCO, Paris. The water conservation model “Project Jal Sanchay” has been selected for the national award for excellence in the Mahatma Gandhi National Rural Employment Guarantee Programme (MGNREGP). The award will be conferred at a function held at Vigyan Bhawan in New Delhi on June 19, 2017. The model is adopted successfully by the authorities in Nalanda district of south central Bihar. India’s first underwater metro tunnel will come up in Kolkata, West Bengal, which will pass through the Hooghly River. The tunnel has been constructed 30 metres below riverbed, just a few metres away from the famous Howrah Bridge. It will be connecting two main terminals: Howrah and Sealdah — each of which has a footfall of about 10-12 lakh passengers per day. The book “Indira Gandhi – A life in nature” presents the former prime minister’s life as a naturalist and examines how she steered India’s conservation policy, which is authored by Jairam Ramesh, the senior Congress leader and former Environment Minister . The author noted that Mrs. Gandhi used her political authority to save ecologically sensitive areas from destruction like the Andaman and Nicobar Islands, the entire northeast and the rainforests in the Western Ghats. Bengali actor Soumitra Chatterjee has been selected for France’s highest civilian award “Legion of Honour” for his outstanding contribution to cinema and theatre. With this, Chatterjee has become the first Bengali actor to be chosen for the award. Anuyatra, a campaign of the Kerala government for persons with special needs, was launched by Vice-President Hamid Ansari. The innovative initiative is aimed at transforming the state to a disabled-friendly one and empower differently-abled children by bringing them to the forefront of the mainstream society. The MPower programme is managed by the Kerala Social Security Mission (KSSM) under the social justice department. Lewis Hamilton has won the 2017 Formula 1 Canadian Grand Prix tournament Canadian Grand Prix at the Circuit Gilles Villeneuve in Montreal, Canada. It is Hamilton’s 6th win at the Canadian Grand Prix and 56th race win of his career. Indian shooters Jitu Rai and Heena Sidhu have clinched the gold medal in mixed team 10m air pistol event by defeating Russian pair in the final at the International Shooting Sport Federation (ISSF) World Cup Rife/Pistol stage held at Gabala, Azerbaijan. They defeated Russian pair 7-6 in the finals. Spain’s Rafael Nadal has won the 2017 French Open Men’s Singles Tennis Tournament by defeating Swiss star Stanislas Wawrinka in final by 6-2, 6-3, 6-1 in Paris, France. Nadal has become the first player in the Professional arena to win the same Grand Slam title 10 times. Nadal, the world’s 4th ranked player, has 15 Grand Slams to his credit. Now, his collection of Slams stands just three behind great rival Roger Federer. Jelena Ostapenk, a Latvian professional tennis player, has won the 2017 French Open Women’s Singles Tennis Tournament by defeating Simona Halep from Romania in the final by 4–6, 6–4, 6–3. Ostapenk became the first Latvian player to win a Grand Slam singles tournament and the first unseeded woman to win the French Open since 1933. She is known for her highly aggressive playing style, including powerful inside-out groundstrokes and a tendency to aim for the lines. Shashikant Kutwal, a railway employee with Pune Division, has won the gold medal at the 17th World Individual Chess Championship for differently-abled, held in Slovakia from May 27 to June 6, 2017. Kutwal (37), who works as office superintendent, has now attained the title of International Master. In the World Championship, held by Physically Disabled Chess Association (PDCA), Kutwal won the gold medal after scoring 7.5 points from a possible 9. Rafael Nadal's magnificent run to a 10th French Open title has earned the Spaniard a move into second in the latest ATP world rankings published. The 31-year-old clinched his record-breaking Roland Garros crown by demolishing Stan Wawrinka in a one-sided final for a 15th Grand Slam crown. Nadal's two-place jump was at the expense of Novak Djokovic, whose French Open quarter-final exit saw the Serb drop from second to fourth, his lowest ranking in eight years. Andy Murray, beaten by Wawrinka in the semi-finals in Paris, continues to lead the list with Wawrinka at third position. India captain Virat Kohli has reclaimed the top spot in the latest ICC ODI rankings for batsmen. With brilliant knocks of 81 not out against Pakistan and 76 not out against South Africa in the Champions Trophy. Opener Shikhar Dhawan has returned in the top Rohit Sharma and Mahendra Singh Dhoni have slipped one place each to 13th and 14th, respectively, while Yuvraj Singh has gained six places to be at 88th spot. Anil Kumble will remain India's coach for the tour of West Indies subject to his acceptance, Committee of Administrators (COA) chairman Vinod Rai said (12.06.2017) in New Delhi, insisting that only the Cricket Advisory Committee (CAC) will decide the next head coach.